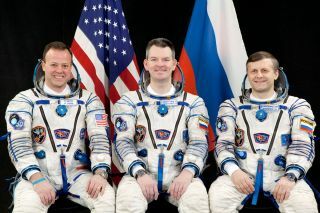 NASA astronaut Ron Garan (left) and Russian cosmonauts Alexander Samokutyaevn (center) and Andrey Borisenko post for a crew photo while clad in Russian Sokol spacesuits.The crew will launch on the Soyuz TMA-21 spacecraft to visit the International Space Station for Expedition 27. Russia's Federal Space Agency has delayed the launch of its next Soyuz space capsule bound for the International Space Station after detecting a failure in one of the spaceship's systems. The Soyuz TMA-21 spacecraft was slated to blast off on March 29 (EDT), but now must wait until the faulty part has been fixed, Russian space officials said today (March 14). "Taking into account the necessity to run additional analysis of the glitch, Soyuz TMA-21 launch is postponed," officials with the Federal Space Agency (known as Roscosmos in Russian) said in a statement. Some Russian news reports have suggested the launch will be delayed to between April 7 and April 10, but Federal Space Agency officials have not yet announced a new official target. The malfunction occurred in the Soyuz's Kvant-V system, which is a two-way radio communications system for the spacecraft. "Failure of a condenser is blamed for the glitch in Kvant-V," Federal Space Agency officials said. The Soyuz TMA-21 spacecraft will launch Russian cosmonauts Andrey Borisenko and Alexander Samokutyaev to the space station along with NASA astronaut Ron Garan to begin a months-long mission to the orbiting lab. The three spaceflyers will join three other astronauts who are already aboard the space station and serve as the crew of the station's Expedition 27 mission. According to Russia's RIA Novosti news service, the mission's launch delay will not hold up plans for three returning crewmembers to depart the space station this week. NASA astronaut Scott Kelly – the station's Expedition 26 mission commander – and Russian cosmonauts Alexander Kaleri and Oleg Skripochka are due to undock their Soyuz TMA-01M spacecraft from the space station late tomorrow night and land on the steppes of Kazakhstan in Central Asia early Wednesday (March 16). The Soyuz TMA-01M spacecraft is a new version of Russia's Soyuz capsule making its maiden flight. It launched to the station on Oct. 10.